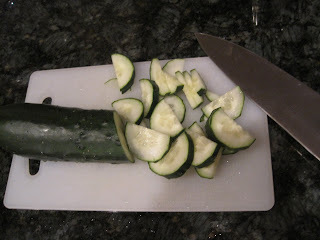 I hate boring salads. There’s nothing worse than tragically tarnished tomatoes hiding amongst limp lettuce leaves and crusty croutons. And don’t even mention fat-free salad dressings. Don’t even think of putting fat-free dressing on this salad I'm going to share with you! I’m sorry, but there are some things I just won’t have: 1. Mayonnaise. 2. Fat-free salad dressing. Both are gross for opposite reasons. All I can think of is a big 'ol tub of lard when I look at mayonnaise. And salad dressing without the fat is just ... well ... sad. 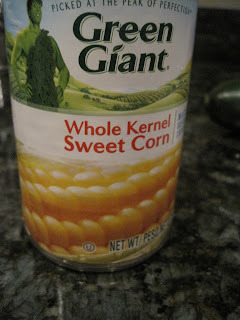 Low-fat ... Ok. But don't take out everything! Some fat – good fat – is important to have in your diet. You just can't overdo it and have salad soup! wasabi vinaigrette. A dreamy destination! Start off with some pretty green lettuce. Doesn't matter what kind. The darker the leaves, the more nutriants in it. 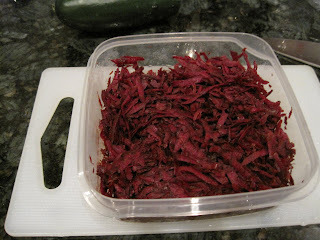 Peel and shred your beets. If you don’t want to be caught red-handed, please wear gloves. Those beets stain! 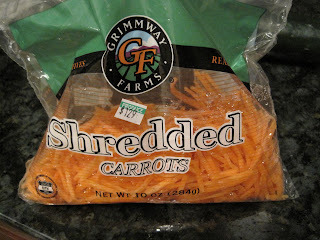 Shred your carrots. Or! If you’re lazy, open your bag of pre-shredded carrots. 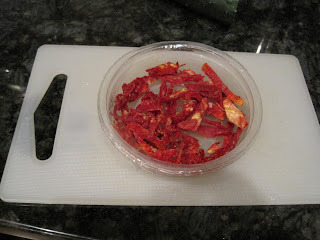 Chop up some sun-dried tomatoes. And plop it all-pretty-like on your leafy greens. Garnish with some sesame sticks and you’re good to go. But the real secret is in the sauce! 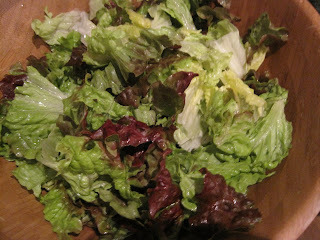 Here’s my favorite: Honey Wasabi Dressing. I like to use a little less oil. This recipe reminds me of Panera’s Asian Sesame Chicken Salad. 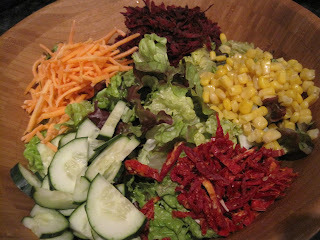 This is called My Most Favorite Salad Ever Ever Ever Ever. How can you argue with that? If you’re sick of lettuce, give spinach salad a try. Or check out this Lime Chicken Chickpea Salad. There’s a whole world of salads out there. And don’t limit your lettuce selection. The Titanic wasn’t a fan of iceburg, why should you be stuck on it, too? What's your favorite go-to salad? *About a year ago, but I’ve got to keep this thing sounding fresh and up-to-date! **If you're in Mass., check out Life Alive. You'll thank me. Well, maybe you won't thank me, but you'll definitely see I was right. Try the Explorer wrap or Chai Alive. This entry was posted by kate, on Friday, April 9, 2010. You can leave your response . Look for post #1 after my lunch break today-- and please be nice about my earlier flowery writing. It's taking an enormous amount of willpower not to delete every old post there. "the soft warmth of the apple flows into the rich onion sugar"